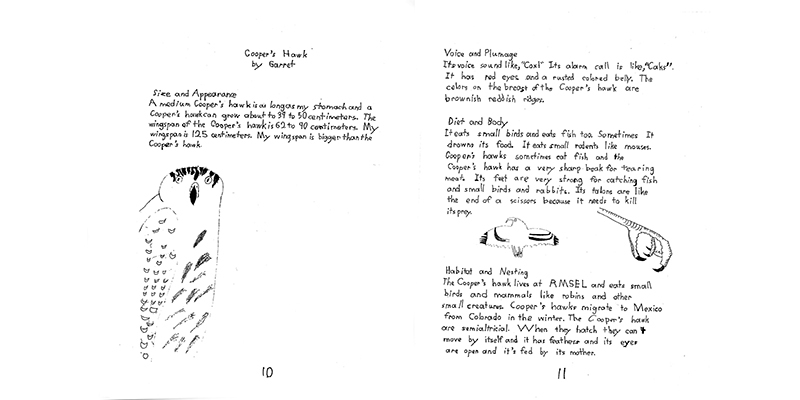 First grade students at the Rocky Mountain School of Expeditionary Learning in Denver, Colorado created this field guide as part of a learning expedition on birds. 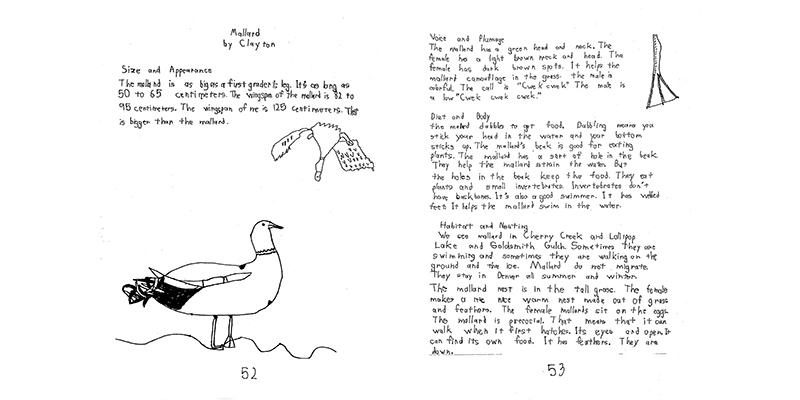 After fieldwork and text-based research, students wrote a large amount of thoughtful text describing the birds. Entries are handwritten and the amount of text is uncommon for first graders. Students developed their own way of categorizing the birds rather than using standard taxonomy. Their innovative taxonomical categories include: climbing feet, killing feet, perching feet, scratching feet, swimming feet and wading feet. The categories are similar to typical general categories used by adults, but also show fresh scientific thinking. I can include an ending to my informational text. With support from adults, I can revise my writing by adding details. With support from adults, I can use digital tools to publish my writing. I can participate in shared research projects. With support from adults, I can answer questions about things I’ve done or learned about. I can use grammar conventions to send a clear message to a reader or listener. I can use grammar conventions to send a clear message to a reader. I can speak using words I hear in books.